Located at a distance of 1.6 km from Baga beach, this is an offering of a one-bedroom guest house which can accommodate up to two people. 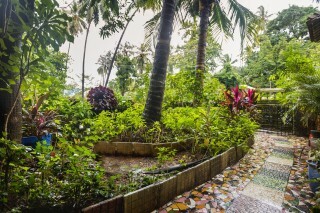 Situated in emerald environs, the place boasts plenty of tall palm trees and houses a beautifully manicured garden, which makes it an ideal getaway for nature lovers. 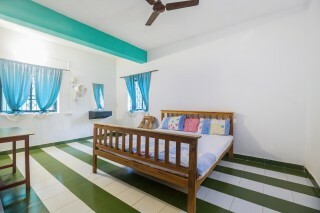 The room on offer boasts patterned tiles in green and white and is simply furnished with a comfortable double bed, a utility table, a wall mounted mirror for convenience and a chair for added comfort. 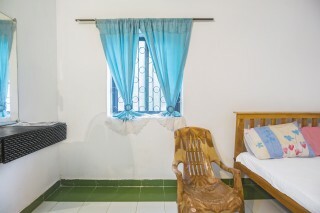 The windows on the two adjacent walls ensure that the room is adequately lit during the day. The attached bathroom is tiled and fitted with western sanitary ware. Travel Assistance is Available Car Rental can be provided. My stay over the property was very good. Rooms were clean and spacious. All the amenities and services were provided. The host was also helpful. 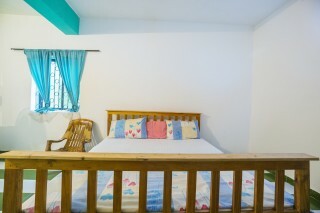 I am happy with the services, definitely going to book again Guesthouser! 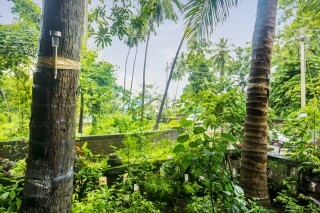 Our experience was awesome in terms of locality , rooms , staff and food too, only one thing was upset us was that our property was far away from the beach, so we loved guesthouser services . Good Job! Place was nice and cheap. Very affordable! 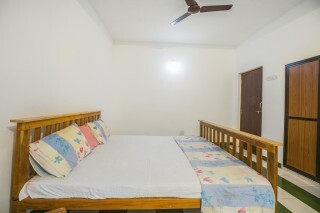 Well maintained room, 50 metres from Baga beach.